You are young at heart but is your age showing on your face? You are very good at what you do, but your scarred facial skin is ruining your confidence? You are an all rounder and a go getter, but your appearance is affecting your personal relationships? If you need a cosmetic transformation and be as young and adventurous as your heart is, fractional CO2 laser treatment from The Esthetic Clinic is just the right option for you to rejuvenate your skin and say goodbye to those depressing times. Over the years, dermatologists have researched and tried to come up solution for various skin problems like scars, blemishes, open pores, wrinkles etc. to make you look younger and beautiful. 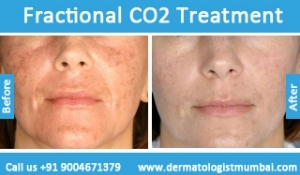 Finally fractional carbon dioxide (CO2) laser, a breakthrough discovery skin treatment of the decade has come to being and now many go through the procedure in order get rid of unwanted skin spots, wrinkles, aging spots, discoloration and scarring.It involves the direction of tiny, concentrated pulses of laser light produced by a 10,600 nm CO2 laser into the skin in order to produce small, micro-sized injuries in the skin to promote healing. 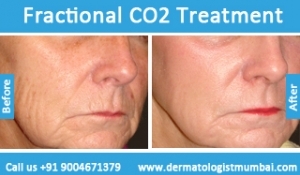 Over the last few years, CO2 laser treatment has emerged as a very promising, and safer alternative to other non-ablative therapies. 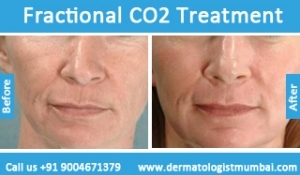 How does Fractional CO2 Skin Resurfacing Treatment work? CO2 laser treatment is essentially a means of bringing about changes in the skin that promote its rejuvenation from within. As you age, your skin–with the combined effect pollution and continued exposure to sun– destroys the collagen in your skin. As the natural aging process begins, the necessary proteins i.e. collagen that keeps the tissue connected, wrinkle-free and uptight, gets destroyed. Therefore, during the CO2 laser skin resurfacing procedure, the doctors use the concentrated beam of light (laser) to penetrate into the skin, , specifically into the dermis of the skin. This heat deposited into the dermal layer stimulates fibroblasts, a type of cell present in the dermis, to synthesise new collagen and elastin, both of which render the skin supple, smooth and elastic. Therefore, CO2 laser treatment systematically promotes the youthful appearance of skin from within, and not just as a surface treatment. . Without damaging the surface layer of the skin, fractional CO2 laser procedure helps in getting rid of wrinkles, acne scars, aging spots and the like. 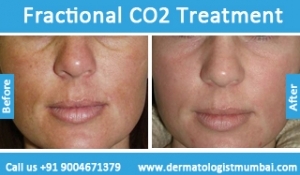 Over the last few years, CO2 laser treatment has become extremely popular in the treatment of various skin problems. Esthetics Clinic has a team of experts, to make sure that the laser treatment provides all patients maximum results with less required time for recovery. 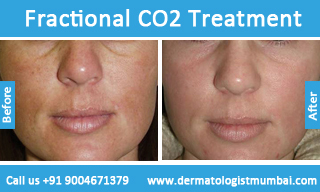 CO2 laser treatment is particularly effective for the treatment of raised structures on the skin, like acne scars. CO2 laser treatment for acne scars involves the layer-by layer depletion of the scarred tissue made up of stiff, inflexible scar collagen and its replacement by soft, smoother materials like collagen, freshly produced by the treated skin. CO2 laser treatment for acne scars has proven much more effective that other abrasive treatments such as dermabrasion or chemical peels. This is due to the highly penetrative, and controlled nature of the CO2 laser. With the development of fractional CO2 laser treatment for acne scars, the process is extremely precise and can be used to target only the acne scars with minimal to no damage to any of the surrounding skin, ensuring safety and lower recovery time. The cost of CO2 laser treatment depends entirely upon the extent of skin to be regenerated or treated, and the extent of scarring in the case of CO2 laser treatment for acne scars. Do consult with your supervising physician about the number of sessions you will need and the procedural costs. Surface of scars can be lasered to reduce the visibility and try to bring them as close to normal appearing skin as possible. Deeper post acne scars may require a procedure called subscision in addition to fillers to break the under scar fibrous bands, before they can be lasered away. Larger traumatic/burn scars may need surgical correction/realignment before starting the laser treatment. Early stretch marks, can be improved by a combination of microdermabrasion, radiofrequency and fractional laser. Laser Skin Resurfacing for rejuvenation, open pores reduction and anti aging benefits, helps in eliminating layers of skin one by one with accuracy. Heat and light of measured intensity are delivered into the desired deeper layers of the skin to regenerate fresh collagen and refill depressed scars. As it eliminates the dead and damaged layers of the skin, this technique also helps to eliminate pigment and thus lightens simultaneously. There could be some pricking sensation during treatment with the laser, though it is done under topical anesthesia application. Some burning sensation post laser for a day is usual, there could be mild redness, swelling post laser for a few days followed by darkening and peeling off of the skin in the treated area. Sun protection is mandatory during therapy. For scars, follow up treatments are usually necessary at 1-2 month intervals along with topical anti scar medications prescribed specially from the clinic. Scars continue to improve over time even after the required numbers of sessions are over. Depending on the severity, number of treatments may vary from 4-10 sessions with 4 weeks interval in between two sessions. When done for anti-aging benefits, yearly maintenance sessions are advisable for best results. What are the points to remember while undergoing this laser? Every skin is different, and one must have realistic expectations and must discuss the outcomes and expected results with his/her doctor. The Esthetic Clinic has been co-founded by Dr. Rinky Kapoor, a leading name in the niches of cosmetic dermatology, skin laser treatments and Dermatologist in Mumbai . 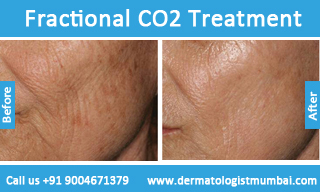 She was one of the pioneers of fractional CO2 laser treatment in India and has years of experience with the same. At The Esthetic clinic, we give customized expert advice and doctors personally perform treatments with the latest technology and techniques in treating any disease/cosmetic concern available world over. Acne is something that can completely ruin your appearance. But worse are the scars they leave behind. If you have ever had acne scars, you know how unseemly they look. However, with modern technology, you needn’t worry anymore because there is CO2 laser resurfacing treatment for acne scars. 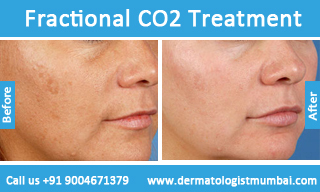 This world class carbon dioxide laser skin resurfacing is something that is now available in India at The Esthetic Clinics. Deciding whether or not you want to go for CO2 laser treatment for acne scars is important. However, if you are someone who doesn’t want to live with scars any longer, then CO2 laser resurfacing treatment for acne scars is the smart thing to do. 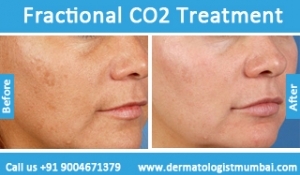 The good news is that now carbon dioxide laser skin resurfacing is available and Dr. Rinky Kapoor probably has the most experience in it in India and world over, for pigmented skin. Your resurfacing dermatologist will be able to guide you on all you need to know about carbon dioxide laser skin resurfacing. CO2 laser treatment for acne scars is non-invasive and is something more and more people are getting done these days, at The Esthetic Clinics. CO2 laser treatment for acne scars is actually an outpatient procedure and you can get it done on your lunch break from work if you so wish. Whether you are have moderate or severe scarring, CO2 laser skin resurfacing is something that will help you. This is especially suited for people who have lost their self confidence because of their severe scarring. CO2 laser treatment for acne scars may be just what you need to get your confidence back. Carbon dioxide resurfacing treatment is getting more popular in today’s times because people are very concerned about how they look. For them, going for carbon dioxide resurfacing is the smart thing to do. Carbon dioxide resurfacing treatment will ensure that your face looks free of acne scars that you may have been suffering from for long. Talk to Dr. Rinky Kapoor at The Esthetic Clinics, about CO2 laser treatment for acne scars today!